It took these sisters a while....but they are getting there. When A was born, EC was 25 months old. Not quite old enough to understand why this baby was here to stay. She was jealous but not old enough to verbalize it. Now she teaches her things...Like how to do puzzles. Their mommy doesn't have a sister. She wants, so much, for them to be close. love the "say cheese" grins! They are so precious!! Ha HA! Yeh Kat, they have that *cheese* thing down down they??? My goodness.....they are so precious! They're precious and I'm betting they will be very close. My daughter's oldest and middle are just 27 months apart and, at 8 and 6, they are inseparatable. We have those same smocked Santa's ~ nothing like little girls in smocked dresses and big hairbows!! Precious moments of sisters together! May I ask where you bought that cute Mickey and Minnie puzzle. My DD has a similar one which she really enjoys playing with and I'd like to find more if I can. 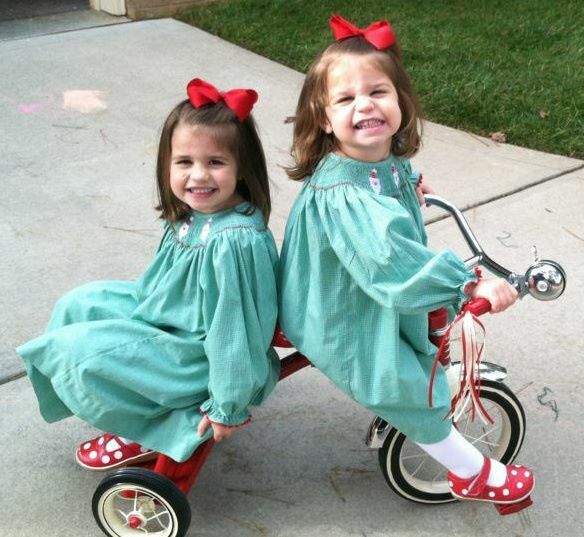 What precious little girls! Sisters are special and I am sure these two will attest to that in the years to come. Love their dresses.